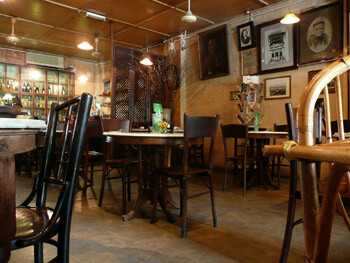 This is a charming restaurant decorated in the original style of the 1930s, specializing in Nyonya cuisine. It may be hard to find in the backstreets of Chinatown, but worth the effort. 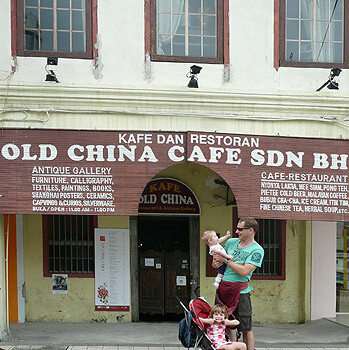 The premises is actually the old guild hall of the Selangor & Federal Territory Laundry Association, and provides a lovely ambiance to experience some local cuisine. The lady manager was very friendly when we visited here in 2010. For entree we tried lobak, which are spring roll like filled with pork meat and sweet turnip, a slight cinnamon flavour and rolled in bean curd skin and served with a delicate slightly sweet chili sauce. For main we ordered the Nyonya Rendang Chicken, a curry with a spicy dark coconut paste with kaffir lime leaves, with a side of blue rice (coconut rice with some blue colored rice) which was very interesting. We also tried Mee Siam, a rice vermicelli noodle dish with a spicy sauce made from candle nut, soy sauce, shrimp paste, tamarind, onion, brown sugar. It was a delicious well balanced meal. We finished the meal with lemon iced tea. Don’t forget to check out the gallery upstairs. address: 11, Jalan Balai Polis, 50000 Kuala Lumpur, Malaysia.